Lots of clients have asked for simple exercises they can do at home so we have just launched our Exercise Library. We will be posting exercise booklets which you can download FREE as a PDF. We have just posted our first exercise booklet on seated exercises you can do with an elastic or Theraband. 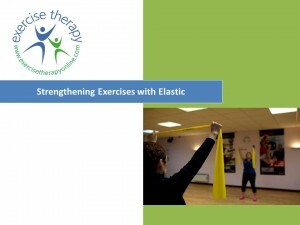 Please ensure that the elastic that you are using is the correct resistance for the exercises. If you have any shoulder problems or have had upper body surgery start with a light band, you can purchase this from our website and the light band is yellow. Remember to work within your range of movement and start with small amounts of repetitions. These exercises should be preformed without pain. If you are concerned about any of the exercises please get in touch. « Do you lock your knees? You may have a ‘sway back’ posture type.